Feeling depressed? Take a walk in the park. Possibly it could help as sun exposure is found to stave off moderate depression when combined with exercise. Exercising outdoors with plenty of sunshine is found to create more endorphins in the body than exercising indoors. Serotonin is your body’s happy hormone. Researches done at Baker Heart Research Institute in Melbourne suggest that levels of serotonin are lowered in winter that regulates your appetite, sleep, memory, and mood. 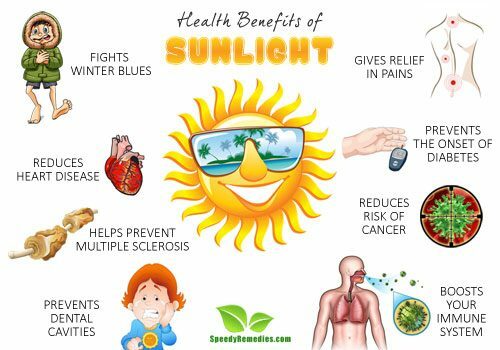 So when you go out in sun it boosts the serotonin levels making you feel happier and energetic. If you find yourself depressed in winter particularly, you may be suffering from winter blues or Seasonal Affective Disorder (SAD) condition. Exposure to natural sunlight may help hypothalamus of your brain to work properly. So by reducing the production of melatonin and boosting the levels of serotonin natural sunlight may help you fight SAD. Make a habit to go out for a walk for an hour in morning during winter months or else, just sit outdoors for fifteen minutes to regain your subsided energy levels. You may have an increased risk of heart diseases in winter than in summer due to reducing levels of vitamin D.
Sunlight provides plenty of vitamin D to your body. So when you have enough of this vital nutrient your cholesterol levels are also under control preventing you from the risk of coronary heart diseases. Infrequent outdoor activity and sunscreen use may have a role in causing multiple sclerosis, which is a disease of your central nervous system, leading to tremors and even paralysis. Scientists have found that kids exposed to sunlight right at their childhood days may have reduced risk of developing this disease afterwards. By having better levels of vitamin D you can smarten and control your immune system. As sunlight may provide you with plenty of vitamin D so it’s good to take a stroll outside on a regular basis. That bright sparkling sun could also help you in keeping your teeth strong! A study revealed that the children residing in areas with less than average sunshine are more susceptible to dental cavities than those who get plenty of sunshine throughout the year. Vitamin D found in sunlight is needed for increasing the absorption of calcium and phosphate from the food eaten by you. Also, it can be helpful in your ability to fight demineralization from bacteria. Thus your enamel which is made up of calcium and phosphate is likely to remain healthy by getting enough sunlight. You may have noticed that warmth of sunlight is quite relieving in pain caused by inflammatory conditions such as arthritis. This probably may be due to the soothing, therapeutic benefits of nature`s best infrared heat therapy. The sun is the never ending source of this type of heat which instantly relaxes you in various painful situations. Since the radiant heat obtained from sunlight is not transferred from a heating source, but rather it gets distributed more evenly, so this method is much more efficient in relieving your pain. Exposing to sun may help the body’s muscles to warm up, easing the stiffness as well. You can keep the risk of developing Type I diabetes at bay by getting enough sunshine each day. As deficiency of vitamin D may lead to Type II diabetes, by taking vitamin D supplements you may get a great help in its prevention at the beginning stage. Experimental evidences have found a connection between vitamin D and cancer risks. Although overexposure to sunlight may be one factor behind skin cancer, it may effectively reduce risk of other cancers such as breast, colon, bladder, womb, oesophagus and stomach cancer. Vitamin D found in sunlight might slow or prevent the development of cancer by promoting cellular differentiation, stimulating cell death, reducing tumor blood vessel formation and decreasing cancer cell growth. A research conducted at Stanford University suggests that brief periods of unprotected exposure to the sun are good for your skin. To heal minor skin conditions like psoriasis, acne and eczema, exposing affected areas to the sun for up to 30 minutes may be fruitful. Make sure you never burn your skin by over exposure. By triggering the synthesis of vitamin D, mild sunlight makes the immune cells travel to the outer layers of the skin helping it to repair the damaged cells. Researchers believe that the so-called sunshine vitamins found in sunlight can play a key role in boosting your immune system and fight infection. Scientists at the University of Copenhagen have found that without sufficient intake of vitamin D, the killer cells of your body (T cells) will not be able to react and fight with invading harmful bacteria and viruses. Believe it or not, but getting a good dose of early sunshine may actually help you keep off those extra pounds by lowering your body’s fat. Even an outdoor walk for 20 to 30 minutes amid morning sunlight will do the job brilliantly! A study done at Northwestern University Feinberg School of Medicine suggests that light can regulate your body’s energy balance by acting as an agent to synchronize your internal body clock that regulates circadian rhythms. Also, by triggering certain genes morning sunshine may also kick-start your metabolism. Although mild exposure of sunlight may have amazing benefits on your health, excessive sun can be distressing for you. In order to remain safe from the threats of heat exhaustion, heatstroke, skin damage and skin cancer, you should avoid harsh rays of sun between 10 am to 3 pm. Early morning sunshine is beneficial for you. Moreover, when you need to move out in noon make sure you cover your face with an effective sunscreen lotion.